I exchanged a few emails recently with photographer Brian Ulrich, who has been working on a Guggenheim scholarship to travel the United States and take pictures of vacant retail spaces and dead malls before they hit the wrecking ball. He has a compelling sample of his work up at his website, Not If But When, which also contains sets from other projects exploring retail and pop culture. 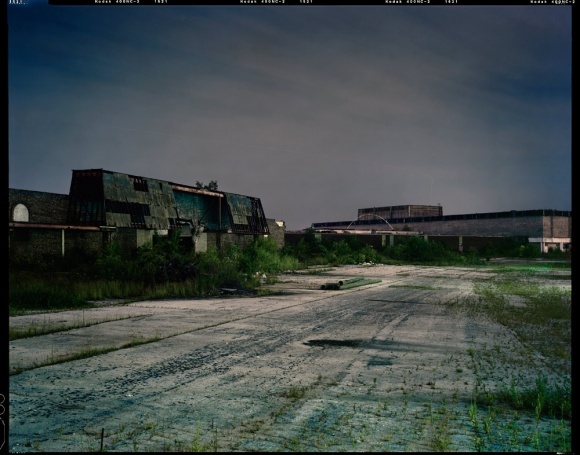 His photos are stark and dramatic, and although we’ve seen some of these very scenes before we were taken with the way Brian’s high-contrast photos capture the lonely misery of these sites. Although I realize a superficial reading of features like these may focus on the disposability of American consumer culture, I think there’s something very genuinely sad about the loss of these important social spaces, which is a big part of why we created Labelscar in the first place. A more serious look at what we’ve lost is sometimes the first step towards realizing why we want to save it in the future, so it’s hard not to be excited about works like this or the release of the new documentary “Malls R Us” (which I plan to see when I can). Brian’s also planning for the work to culminate in a book of his work some time in the near future. Check out what he has so far; I think most Labelscar readers will be impressed. There is also an upcoming exhibition of “Dark Stores, Ghostboxes, and Dead Malls” at San Francisco’s Robert Koch Gallery from September 10th-October 31st, for anyone on the west coast. The labelscar on the second picture (Circuit City) looks really spooky. Great pics–he really captures the desolation of dead retail, as well as its poignancy (“Over 100 years”, the intact beauty shop space). There is something ghostly about dead malls and boxes compared with say, a main street with vacancies. this may be why dead malls are so difficult to revive–they become truly dead spaces. The Belz Factory Outlet one is just plain FREAKY. Is that the one in Orlando? @Jonah Norason (Pseudo3D), pretty sure it’s the notorious one in Allen, Texas, near Dallas. It was only open for three years from 1984-87 and has sat abandoned since. It appears no one even knows who owns it (Belz claims to have sold it many years ago). I think you all are right – it is the Belz in Allen. I live near there and I didn’t even know about it. Allen is one of the wealthiest communities you could imagine so this shocking that it has remained a safety hazard for over 20 years. There is a new, really nice outlet mall with Coach, NM and so forth not far from there. It is not in close proximity to homes or other retail so I guess no one complained that much. Very moving pictures – thanks for sharing them. Makes you really appreciate film. Wow excellent find, it really shows the sense of desolation that these places leave behind when they’re abandoned. Also shows darkness almost creepiness of dead malls. The Belz Outlet in Allen is truley creepy. It has been vacant for over 20 years, and there are rumors of gang activity, and murder, and health risks…..all from viewing distance of one of the wealthiest, more prominent cities in Texas.